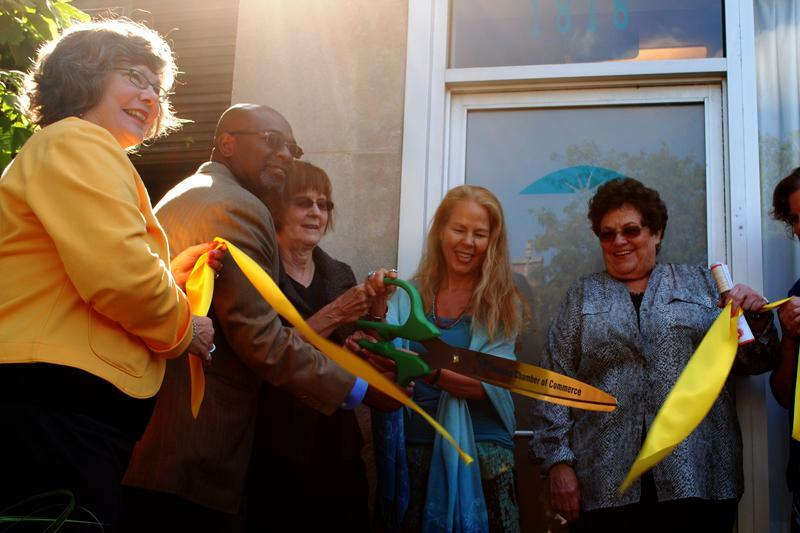 Heartwood Center owner Nancy Floy leads a ribbon-cutting ceremony Monday morning. The center, 1818 Dempster St., opened a new addition called Skylight. When Nancy Floy’s tenant moved out of a warehouse adjacent to her west Evanston wellness center in June 2012, her business lost a reliable source of revenue. More than a year later, Heartwood Center, 1818 Dempster St., has roughly doubled in size and drawn more practitioners offering expanded areas of expertise. Floy introduced a new Heartwood addition during a ribbon-cutting ceremony with city officials Monday. Known as Skylight, the new area provides more space for practitioners who specialize in health services such as acupuncture, chiropractic medicine and psychotherapy. Heartwood is also using 3,400 square feet of the addition as an event space. During the ceremony, Floy discussed the difficulty of affording the space formerly occupied by Evanston ReBuilding Warehouse, which sold recycled building materials. The total cost of renovating the former warehouse was $360,000, Floy said. Fifth Third Bank loaned Floy $100,000 to start the project, and the city later matched the amount with tax-incremented finance funds. To cover the remainder of the costs, Floy said she mortgaged her Evanston home a second time. “This is a project about collaboration and what happens when we set our egos aside and set ourselves aside and we work together as a community to collaborate,” Floy said. In revamping her business, Floy said she hopes to attract practitioners from different ethnic backgrounds and with different skill sets. Floy said she is setting aside four empty spaces for additional practitioners. Chiropractor Arnetra Gilliam-Wharton said she wanted to join Heartwood three years ago and will now move in thanks to the addition. Heartwood is located near Evanston Plaza, a largely vacated shopping center that the city is trying to revitalize through TIF funds. During the ceremony, Ald. Peter Braithwaite (2nd) pointed to the Erie Family Health Center, which will soon move near the plaza, as another positive sign of economic development in his ward. Heartwood will host an open house Oct. 5, the same day of Skylight’s grand opening.